Are you about to prepare an important PowerPoint presentation that includes a lot of data? If so, including charts to represent the data would be the way to go. So, the next step would be to visualize charts. Have you tried using Think-Cell for visualizing charts? Itl is a great go-to tool when you need visualization ideas for charts. You can create amazing charts using think-cell. There’s always something new to learn. It a PowerPoint add-in tool and an effective charting tool which makes chart creation an easy, simple and quick task. It addresses the typical PowerPoint charting pain points like modifying elements, having easy access to elements, using arrows and many more such features. 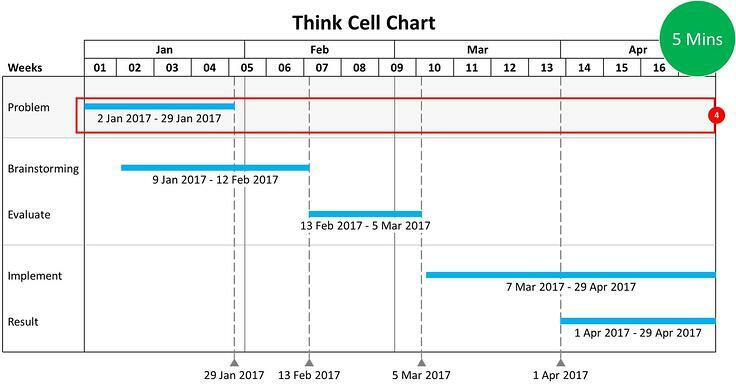 Think-Cell Charts’ processes are not very different from PowerPoint charts. In fact, the underlying datasheet is Excel, and when you select the data, or edit the data you will be working on the underlying spreadsheet. So, you will pick up the usage intuitively. 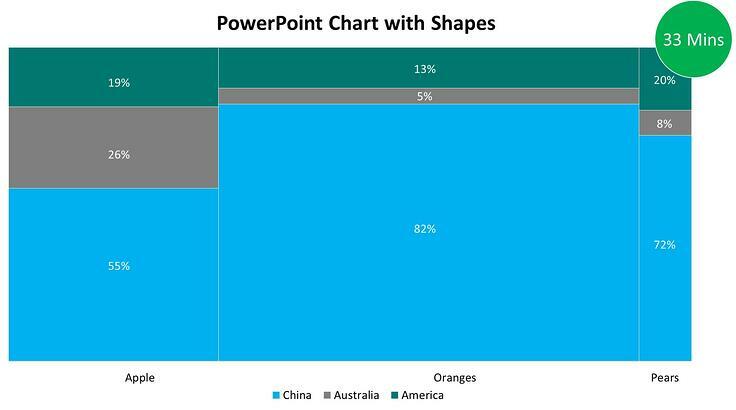 Several frequently used chart types and elements that are missing in PowerPoint are covered by Think-Cell. 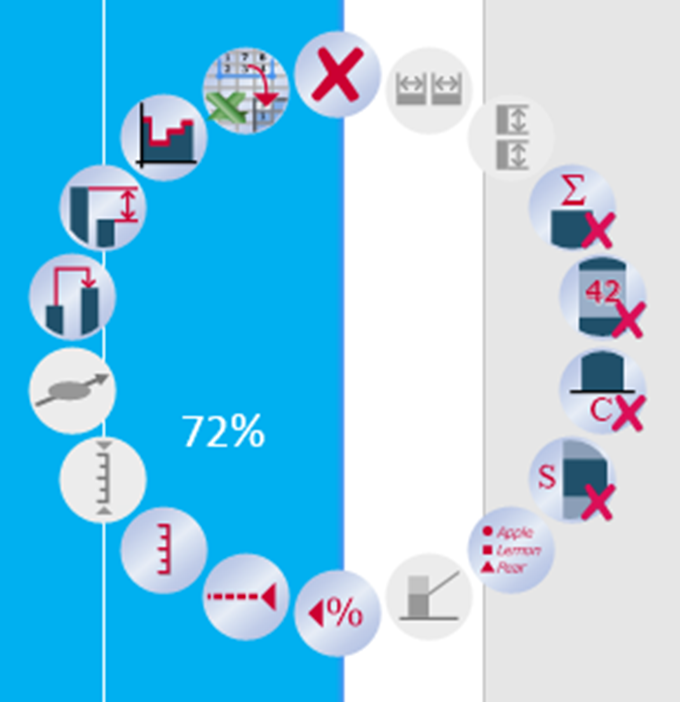 How to Visualize Charts for Corporate Presentations the Right Way: A Step-by-Step Guide. Leading consulting firms use Think-Cell becau se it saves 70% of their time when working on charts. Let’s look at some unique Think-Cell charts, not present in PowerPoint, that help speed up chart production and save time. What do you do when you have a timeline slide? 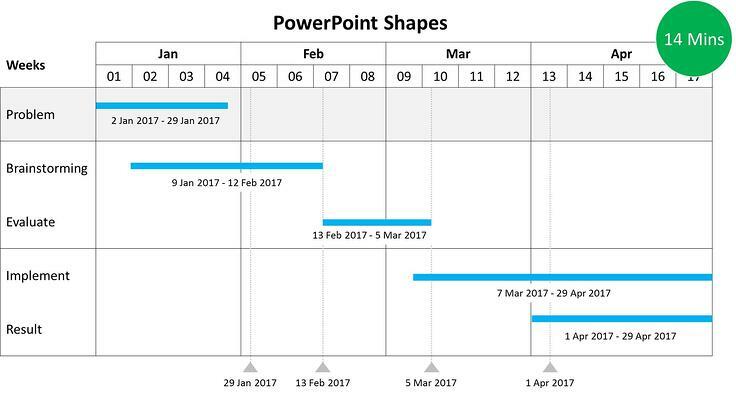 Chillibreeze designers would create the timeline using tables and shapes in PowerPoint. Gantt charts are a little complicated, but Think-Cell make them simple to create. 1. To insert a Gantt/Timeline Chart → Click on Icon in Elements menu. 2. Modifying the data range: When you insert a timeline/Gantt chart, the calendar is automatically scaled to show some time before and after the current date. Double-click on the scale to open the calendar. All you need to do is to click and drag the handle that appears on the selected scale. 3. Scale labels and separator lines: Right click on the line and you will get multiple options like add vertical separator line, add scale label, etc. Bars show the duration of some activity. Process arrows are like bars but contain text. Brackets are used to label periods of time which typically comprise multiple activity bars. Note: There is a hidden row below the chart that is reserved for important milestones. You cannot add bars to this row, you cannot move it, and you cannot delete it. It is an additional activity row which is always there. A Mekko chart is quite similar to a stacked chart. The only difference is that a Mekko Chart has varying column widths. Creating a Mekko chart manually can take a lot of time. It is not available in Microsoft PowerPoint, which makes it even more complicated to develop without Think-Cell. Let’s look at its unique features below. I created a Mekko Chart in PowerPoint and timed myself. It was very simple and easy, but the only drawback is that it took a lot of my time. But when I created a Mekko Chart using Think-Cell, it saved 90% of my time (see images above). Let’s look at the step by step guide on how to use a Mekko Chart. 1. To insert a Mekko Chart → Click on Icon in Elements menu. You can either select Mekko (% Axis) or Mekko (Unit Axis). 2. To describe the width of a column, you can enter it in the Width row on top (as highlighted in the image below), and individual segment heights are entered as in a regular stacked chart. 3. To get more options on the use of Mekko Chart, right click on the chart and hover around it. Think Cell makes it so easy to use its charts that you don’t need any prior training. The process is quite intuitive. 4. 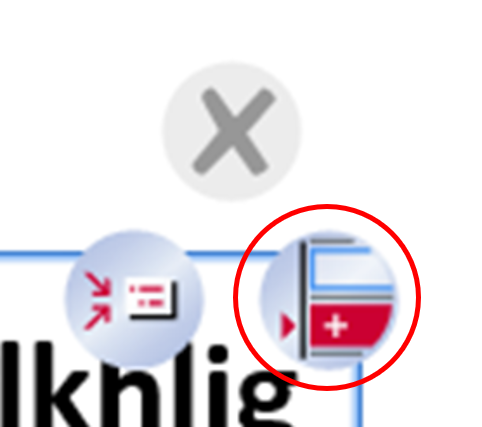 You can highlight the outline of the Mekko chart by clicking on the Ridge button to add or remove a bold ridge. 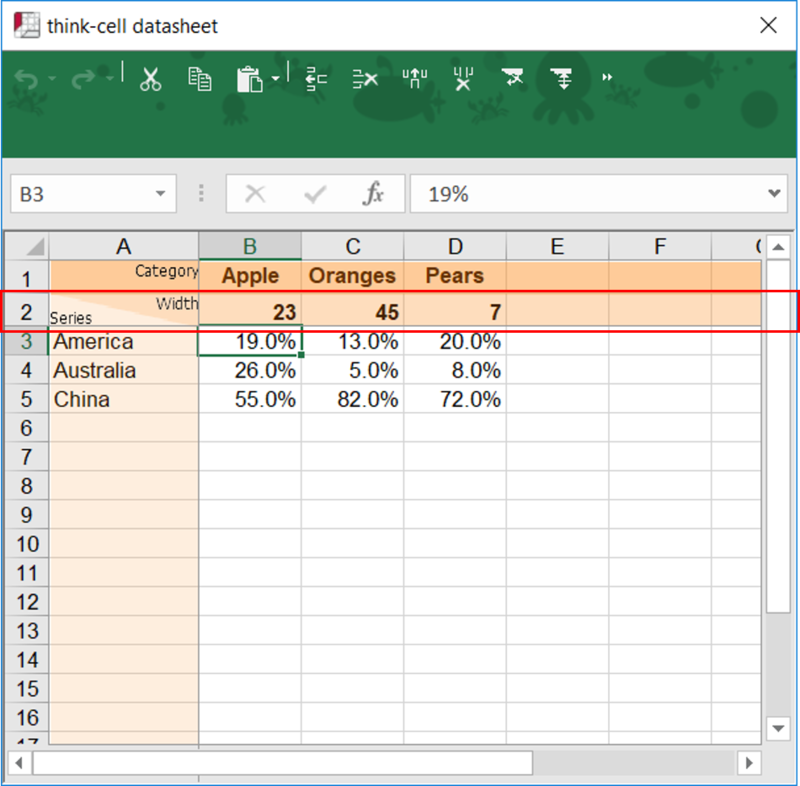 NOTE: You can also combine several segments representing small portions of a category into one section for “Other” without adding the data in excel sheet. This way, an “Other” series is added to the chart. To create an “Other series” category, select all the segments, right click and choose “Move to Other Series”. Once an “Other series” is created, to include or exclude segments that should be displayed individually you can select and drag the handle that appears at the top and bottom to include additional segments. If you recreate an agenda slide and then place it in a PowerPoint presentation, to change the order of chapters or topics in the agenda, you have to redo the slides again. By using the agenda in Think-Cell, you can manage, create a table of contents and add, arrange or rearrange individual chapters. All agenda slides are automatically kept in sync as you edit the presentation. 3. Reordering agenda chapters: Drag the chapter heading to a new location using the mouse. You can also reorder the slides by going to slide sorter view, drag and drop, or copy and paste and duplicate them as you would do for normal slides. If you change the order of chapters, all agenda slides are updated accordingly. 4. Multi-level hierarchy of chapters: It is almost the same as you do in PowerPoint, all you need to do is click on the increase and decrease Indent in Home tab. In slide view, double-clicking a chapter heading will take you to the associated agenda slide. If a picture is worth a thousand words, then a chart is worth a thousand numbers. A well-constructed graph or chart can give your audiences a quick overview of your data. Visualizing and using the right chart saves a lot of time and allows you to add an extra dimension to your presentation and display important statistics in a consistent manner. 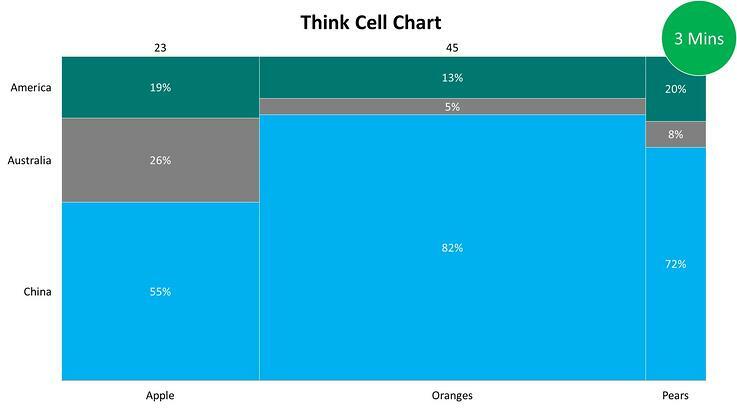 Making charts in PowerPoint is easier, but using Think-Cell as an add-in to visualize is like a cherry on top of a cake. Have you tried Think-Cell? Let us know your experience by leaving a comment below.